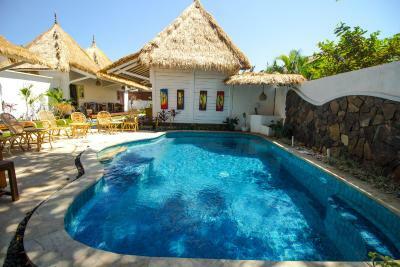 Lock in a great price for Gili Breeze Tropical Bungalows – rated 8.8 by recent guests! Good breakfast, we recommend fried noodles and banana pancakes. Bangalows were clean and cute. Hosts were very polite. Very good wifi. Gili Breeze was such a treat! The grounds were beautiful, the swimming pool was inviting, the room was charming and comfortable, the staff were friendly and welcoming throughout our stay. It is very close to everything you need and if you want to explore the island further there are bikes for rent. We were concerned about coming after the earthquake, but the island is up and running and we had absolutely no concerns once we arrived. 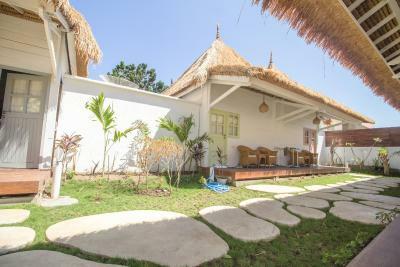 You should definitely come to Gili T and you will LOVE your stay at the Gili Breeze! We traveled a lot around Gili and Lombok for bussiness purpose in tourism and Gili Breeze meet our expectation, staffs are very polite and supportive. Rooms are clean and swimming pool also very clean. 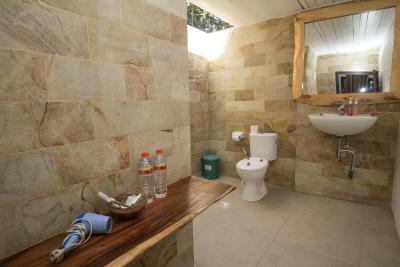 Love the idea of having some safety box inside our room, regarding the open air bathroom. 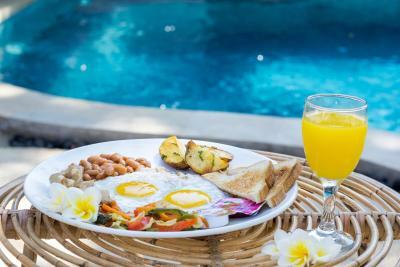 Breakfast is good with choices of bread and pastry, fruits slices, cornflakes and milk, and omelette or pancake options as side order. We had room on second floor and we found it very nice as it feels like we have private area. And most important, this hotel's location gives you chill temperature despite of the heat and busy main road in the island (away from the crowded if you're not party persons). We stayed there for just 2 nights but thouroughly enjoyed our stay. 7-8 minutes walk to the beach and away from the party zone. Super friendly staff. Its a small property but has a cute little swimming pool. Hot water is available 24 hours. Nice spacious room with a large super comfy bed. Breakfast was quite good. Close to marts, restuarants and bars. What I liked the most was the helpfulness and friendlyness of all the staff. Special mention of Warin and Yawn (not sure if I spelled correctly). All the guys took super care of us. They also let us use their kitchen to cook for our baby. Tea, coffee and fruit juice is available 24 hrs. I will highly recommend and would definitely stay when I go back to Gili T.
Cozy place with helpful staff. Highly recommended. 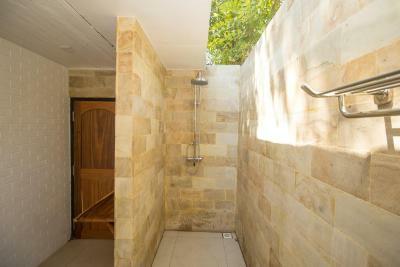 Gili Breeze Tropical Bungalows This rating is a reflection of how the property compares to the industry standard when it comes to price, facilities and services available. It's based on a self-evaluation by the property. Use this rating to help choose your stay! 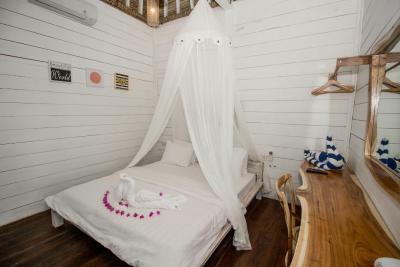 One of our best sellers in Gili Trawangan! 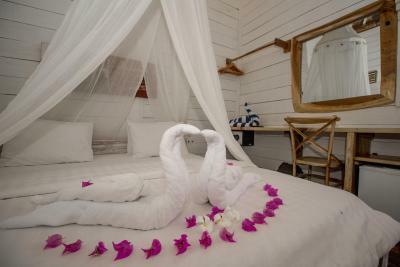 Combining rustic and tropical elements with modern amenities, Gili Breeze Tropical Bungalows welcomes guests in Gili Trawangan, not far from Turtle Conservation Gili Trawangan and Gili Trawangan Art Market. Complimentary WiFi is provided. Guests can relax by the outdoor swimming pool. 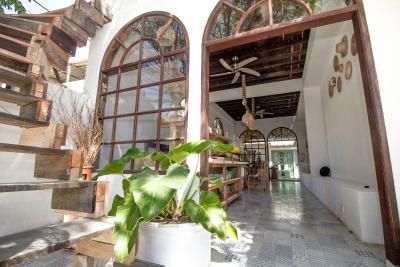 With white-washed furnishings and chic interiors under thatched roofs, rooms at this property are all air-conditioned and equipped with a flat-screen cable TV, a fan, and a fridge. 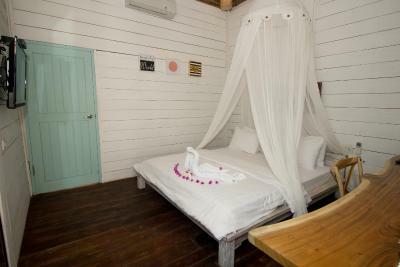 The beds are fitted with mosquito nets. 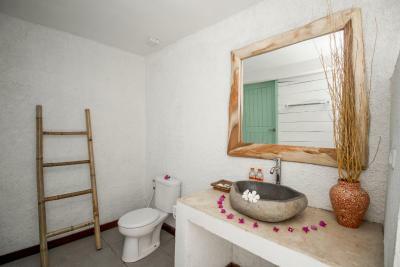 Free toiletries are provided in the private bathrooms, where guests can use the semi open-plan shower facilities. Fresh towels and bed linens are provided. Each unit comes with a seating area with a desk. 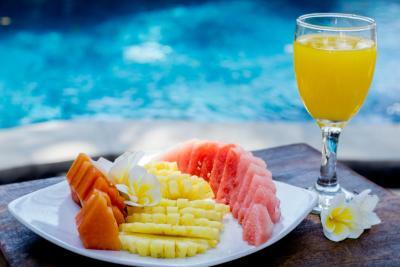 Simple Continental and buffet breakfast options are available each morning at this property. 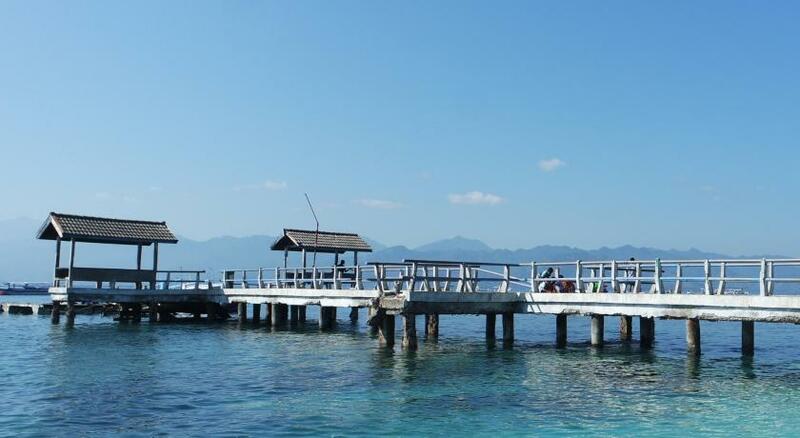 Gili Trawangan Harbor is a 5-minute walk from the accommodations, while Sunset Point is 0.9 mi from the property. 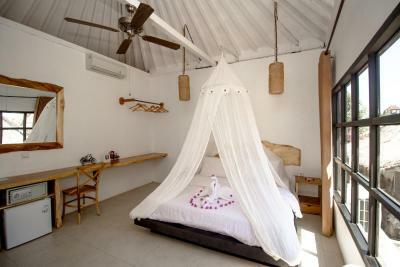 When would you like to stay at Gili Breeze Tropical Bungalows? 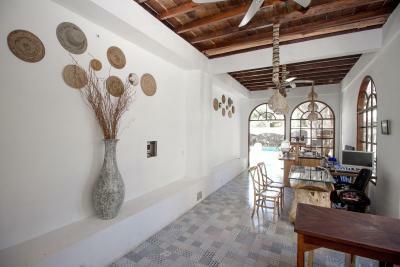 This bungalow-style room comes with air conditioning, a ceiling fan, a flat-screen TV, and a fridge. 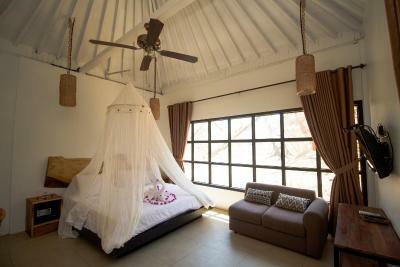 The bed is fitted with mosquito nets for your comfort. 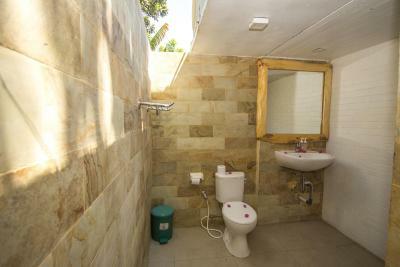 Private bathroom offers semi open-plan shower with free toiletries and fresh towels. Guests enjoy a private terrace with a seating area. This bungalow-style room comes with air conditioning, a ceiling fan, a flat-screen TV, and a fridge. 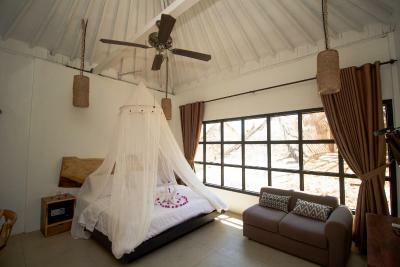 The beds are fitted with mosquito nets for your comfort. 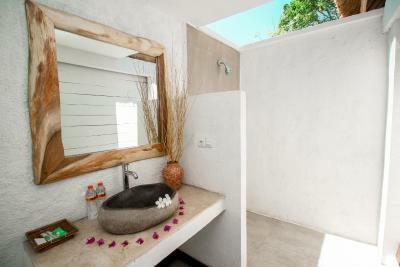 Private bathroom offers semi open-plan shower with free toiletries and fresh towels. Guests enjoy a private terrace with a seating area. 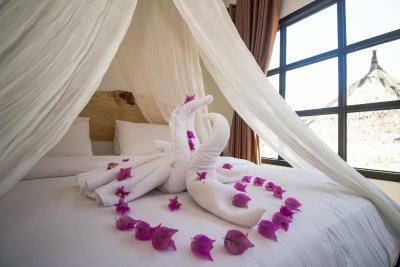 House Rules Gili Breeze Tropical Bungalows takes special requests – add in the next step! Gili Breeze Tropical Bungalows accepts these cards and reserves the right to temporarily hold an amount prior to arrival. Please inform Gili Breeze Tropical Bungalows of your expected arrival time in advance. You can use the Special Requests box when booking, or contact the property directly using the contact details in your confirmation. The staff was friendly, but maybe TOO friendly. I was travelling on my own and sometimes felt too observed by them. Also, there were like 8 employees to look after 10 rooms, maybe too many of them. But what annoyed me was the fact they were using the empty rooms to take shower, sleep and so on. Where was the manager? I liked the comfortable bed and the bathroom, as well as the pool, which was always clean. The location was good: far enough from the crowd, but close to shops, restaurants, cafés and bars. The rooms were very unclean, with bugs in the bed and a strong musty smell. The staff were friendly and very attentive. Hotel was in a good location. However, the television didn't work (I asked staff and they didn't know either). I didn't mind the television not working at first, until I got food poisoning and as a lone traveller I really needed something to keep me going while I was ill in bed. I then found out my toilet wasn't working, whilst I had food poisoning on my first night and having the toilet not working for that day was not a pretty sight. I was too ill to go outside to ask for help with the toilet and there was no telephone or anyway of contacting staff other than leaving the room and going to reception- which was difficult in the state I was in. Also the shower rarely had hot water, which again was difficult during my sickness. The place wasn't cheap and that is why I chose it, so I expected more from the facilities. In addition the bungalow is really near a mosque and the prayer call was very very loud and kept me awake. They did warn me when I checked in, but this isn't advertised on the website it was bad when I was ill.
On first impressions the place was very clean, the staff were friendly. The rooms smelt a bit damp, I think this is the nature of these huts and it rained a lot during our stay so it probably isn’t that bad during dry season. The staff were amazing! They were so friendly and really helpful, would return for them alone. I didn't like the door locking mechanism.....key in door. Mosquitoes were an issue, but they are in many places in Bali. Location was convenient to the Harbour and horse carts were widely available. Breakfast was OK. The staff were very friendly. I had a chance to visit the place along with the group of 19 people. We really liked close distance to the beach, extremely nice and animating staff (they were simply awesome). Great advantage of the place is also tasty breakfast, served quickly - highly recommend to try their banana pancakes! It was fun! Fun design.The stuff is very nice there! There are some cool places right near gili breeze. When it was raining outside, inside also raining, my bags and things full of water from the roof, looks like I was sleep without roof ,many water let the pillow and blanket wet, fortunately,I didn’t put my phone in the table. I didn’t fall asleep after the rain , many water in bed So terrible night, no one swimming in the pool, water from pool looks dirty. Great rooms, amazing staff, I had a great time there!